Hi friends! 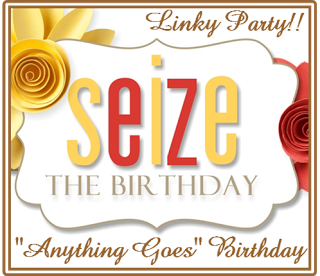 I have a very exciting announcement to make: I've been invited to be on the Design Team at Seize the Birthday! I'm very honored to craft alongside such a talented group of ladies. Thank you for inviting me to be a part of your team! This challenge the "Toppings" option is Lots of Leaves, but if you're not a "Toppings" kind of person you can always go with an "Anything Goes" birthday card. This is a two week challenge (love that!) so you have plenty of time to play along. As long as it is a birthday card, you are good to go! Lots of Leaves made me think of my Foliage background stamp from Hero Arts, and I decided to use it with an emboss resist technique. I stamped it onto watercolor paper with Versamark ink and heat embossed with clear embossing powder. Then, I used a piece of acetate, distress inks and water to add some color. I wanted to take a break from the autumnal colors I've been using so much lately, and went with some jewel tones. Ink colors are detailed below. I am also playing along with the Wednesday Challenge at Simon Says Stamp, where they would like us to use the color pink in our projects in honor of breast cancer awareness month. Beautiful background and wonderful mix of colors! Congrats on you DT spot at Seize the Birthday! Looking forward to seeing more of your creations! Sandy, first a very big and warm welcome to the DT spot at STB! We are so happy you are joining us! Fabulous card with a gorgeous background! Hi Sandy, welcome to the Seize the Birthday DT. We are happy to have you with us. Love your pretty card and the colors you used. Love the card. Perfect time to "Seize the Birthday"
congrats are in order! I love your jewel tones..what a beautiful creation! I love autumn colors, but it is nice to leaves used in a different way! I also just realized how low my birthday card stash is getting, I should get on board and make a few!! 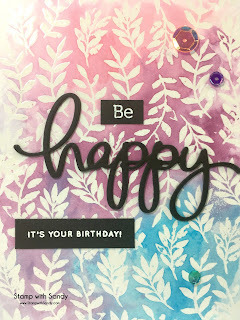 And I simply loved your card- its so pretty, I love that embossing and then the partial coloring, and your color choices - it looks amazing!! Welcome to the team here at Seize the Birthday. We have an amazing group and now with the three of you, we are pretty special. I love the choice of colors that you chose for this card. It is a very nice breather from the usually fall colors. This is terrific! Love the background & the way you did the sentiment. Welcome to the team - happy to have you! It's funny, you and Shirley chose close to the same colors this week! Isn't that weird? We are thrilled to have you with us at STB and your inaugural card is fabulous! Have a great day! Sandy, wonderful addition to the Seize the Birthday team - and what a great card to kick off your designer stint! Fabulous. Beautiful fall card in unique colors! So glad to be with you in Seize the Birthday team :)!!! hello sandy! this is awesoem, I so luv the random colored background...nicely done! I am so glad you played along with us at simon says stamp wednesday challenge! beautiful background and I like the non traditional fall colors! Your card is really beautiful! 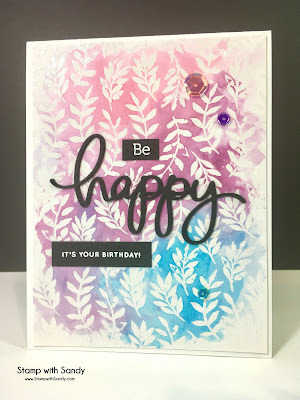 I love the resist technique and the colors you've used are beautiful! !